a significant effect on breeding success. Location – Observers should record the county, place and grid reference for the nest. The geographical location of a nest can affect breeding success due to differences in habitat and weather conditions. Nest Contents – After identifying the species that has built the nest (often the easiest way is to watch for the adults), it should be visited on several occasions (for example every four days). The stage of development of the nest, eggs and young should be recorded using the simple ‘Status Codes’ provided. A series of visits to a nest throughout the nesting period is more valuable than single visits to a number of nests, as multiple visits allow us to calculate egg and nestling survival rates. Date – Recording the year in which the record was collected allows calculation of annual changes in productivity. The date of each visit is also important - the timing of breeding may affect its success. Habitat – The type of habitat surrounding the nest may influence a variety of factors such as food availability, competition for nesting sites and predator abundance. These could all have an effect on breeding success. Collecting habitat data therefore allows us to investigate these relationships. Nest Site – Is the nest well hidden or exposed? Is it on flat ground or in a bush? Again, nest site details such as these may influence breeding success. For example, nests high up in a bushes or trees may tend to be more successful than those at low level. Which species do nest recorders monitor? 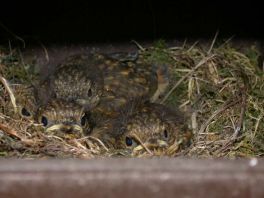 The Nest Record Scheme welcomes records for ALL nests of wild birds, not just the rare ones, as long as it is possible to see into the nest to record the contents. We do have a number of target species that would benefit from the collection of more data to improve the accuracy of our estimates of breeding success. We are particularly keen to receive more records of open nesting passerines, such as pipits, larks, chats, warblers, finches and buntings. Numbers of records for this group have declined rapidly since the 1970s, even for widespread species such as Dunnock and Greenfinch, so if you do find any we would be very grateful for your records. Over 1.25 million nest record histories from 232 species have been received by the BTO since the Scheme began. Around 30,000 nest records are submitted each year, covering 160-170 species. A network of around 600 volunteers spread out the length and breadth of the UK underpin the NRS. About half of the observers are members of partnerships, bird clubs or ringing groups. The total number of nest records received each year is published in NRS News. Although nests of all wild birds can be monitored for NRS, some species are specially protected, including Barn Owl, Kingfisher and Little Tern—a full list is here. If you want to monitor a specially protected species for NRS, you must first obtain a licence/permit. Please see the Protected Birds page for more information. How are NRS data used?